Tokyo is known as a huge, ultra modern city and that’s what it is. Yet the Japanese capital hides wonders in it. The old Japan still exists in many parts of the city and you will find it, just walk around. 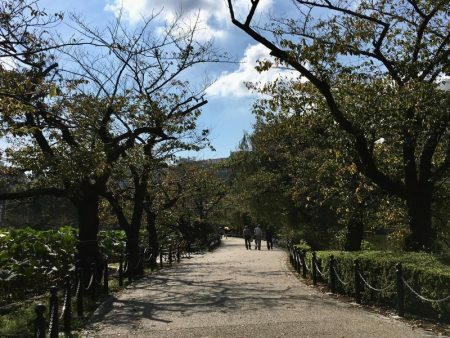 This post will show you four easy walks in Old Tokyo. You can find the old Tokyo in the shrines and the red arched tunnels outside them. You can find it in the manicured parks with lotus ponds and sakura trees, and in old suburbs that stood out the wars and earthquakes. I spent four days exploring the huge city mainly looking for the old, traditional Japan, using the subway, a lot, to get to the places where I started walking. I will show you my walks, where I started, where I ended and what I saw on the route. With 36 million people in the metropolis Tokyo is the world’s biggest city, almost double the size of Mumbai and Mexico City. Let’s dive in and start exploring! Walk two takes you to North Tokyo and you will see temples, a huge lotus pond and Tokyo’s hanami party place. The Yanaka and Nezu walk will show you the most original part of Tokyo, also in the north. Itinerary 4 is an evening walk. You will see Tokyo’s old downtown Asakusa and the famous Senso-Ji Temple. It all looks even better after dark! My walks in Old Tokyo are short, only 2 to 7 km in distance. I will show them to you after a few words about Tokyo subway. I was surprised how easy it was to use the Tokyo metro. Down the stairs, follow local behavior, know where to stand, give way to others – and take a metro map. At most stations you will find the official Tokyo subway map. You will first see its Japanese side that looks a bit scary. But don’t bother. The back side has the same map in English. Click on the map to see in a bigger size. This is the map I used and didn’t need anything else. I also downloaded a Tokyo metro app but could do without it. The paper map was good enough. And as all station signs were in English I had no problems finding my way in the labyrinths of the world’s biggest city – that also has some of the world’s biggest stations. There can be trains in five different floors below ground level. The only problem at the biggest stations was finding my way up to open air to the right side of the station. What about subway tickets then? My friends told me to buy all my metro tickets at arrival at the airport. So I did that and I bought tickets for my whole stay. I combined one, two and three day tickets. I was told these tickets are a bit hard to find in the city. Narita airport’s a subway ticket counter is in the arrival hall, before you take the escalator down to where the trains are. It’s one of the bus and train ticket counters and nothing tells that they also sell subway tickets. Ask if you don’t find it. The big tickets on the photo are the kind of Tokyo subway tickets you should buy. The small one again is a Rinkai Line ticket to Odaiba island. That one you can buy in a ticket machine when you travel. More information on Tokyo Metro on the Tokyo Metro website. So that was the subway and now the four walks in old Tokyo. The large green area on the Tokyo map is the Imperial Palace Grounds. It’s what all visitors want to see in Tokyo and we will do that too. But first in the afternoon. 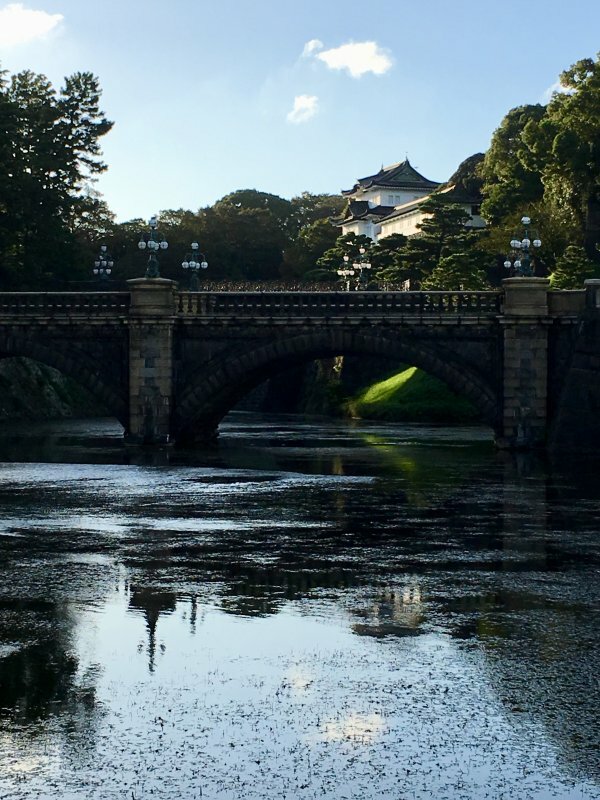 Before that we will take the subway to Korakuen station (green, red or purple line) and walk in Koishikawa Korakuen Garden and on to the palace gardens. The walk will end at the yellow line Sakuradamon station and the total distance is 7 km. South of Korakuen subway station you will find a sports area with a big glass roofed arena in the middle. That’s Tokyo Dome, a baseball arena. You can walk round the dome if you like or skip it. You will have to walk half way around the Koishikawa Korakuen garden block. The garden entrance is in the opposite corner and there is a small fee. Koishikawa Korakuen Garden used to be a private family garden. It is what Japanese gardens are at their best but this one is added with a Chinese touch. The Koishikawa Korakuen park is like from a fairytale world. Cut trees, stone and wood bridges across calm ponds and small rivers in between. And of course Japanese cherry trees, a lot of them. At the time I was visiting cherry trees were not in flower. They began to turn red which looks equally beautiful. The family that owned the park used a Chinese garden designer that really did a great job. The red bridge (above in the photo) looks like the famous Kyoto bridge. It has red poles supporting its arch which makes a fantastic reflection in the river below. Another bridge is called Full moon bridge and it also makes reflections (see the photo). Locals were coming to the park for photos and I too got dozens of fantastic shots a part of which I posted to my Instagram account. Now we have to walk through the modern city and cross a main street. The place is Kanda River south of Koishikawa Gardens. But we will walk on and get back to the old Tokyo. Next stop: Yasukuni Shrine. This shrine has a pretty setting but that’s not the whole truth about it. 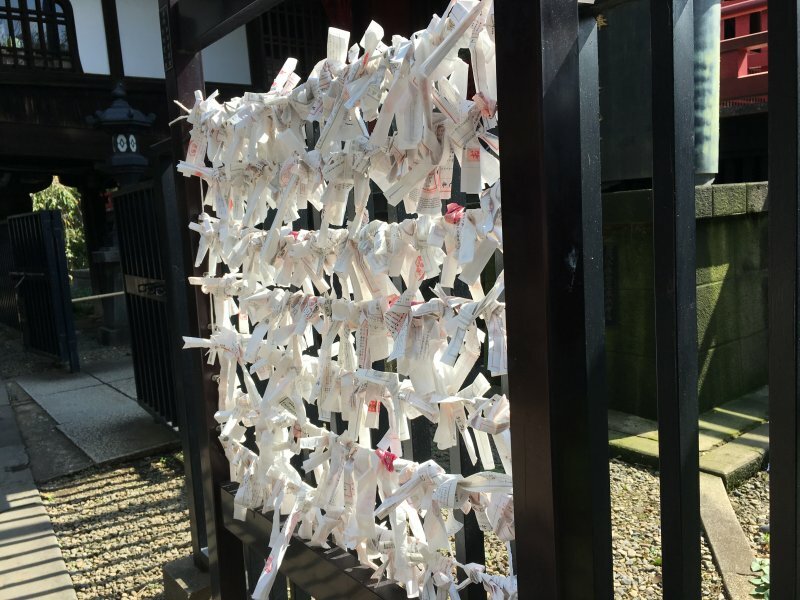 The shrine reminds us about dark times, about Japanese wars. Yasukuni Shrine is made for the 2.5 million Japanese who died in wars. Ashes of most of them are here which is why there are visitors coming at all times. This place makes me sad since Yasukuni Shrine s a very controversial place. After the shrine you will enter Chyoda-Ku island and the palace grounds. This green island used to have a huge Edo castle, the world’s biggest. The castle disappeared but still today Japan’s emperor rules from this island but not from this place. He has a much smaller castle. His castle is in the south part of the island and we will see it. The north part is all park and has winding paths in the dark woods. And there are some museums: the National Museum of Modern Art and a science museum. The next island has the East Garden (Higashi Gyoen). It looks like a planned Japanese garden but is much simpler than Koishikawa. There are a lot of different plants and beautiful flowers in summer (no flowers in autumn) and the picnic lawn is huge. But there’s not much more to see. I was expecting this is the place where the Japanese emperor rules but he doesn’t live here. We have to keep on walking to find him. You can tell the city is still growing. For how long can cities grow before they get too big? Tokyo is not too big. The Japanese are so well organized that it doesn’t matter if the city is big. Then we found the palace. This is Nijubashi Bridge north of Sakuradamon station, the only location from where you can spot Japan’s imperial palace. The palace hides behind the bridge, in a secret garden surrounded by a moat and massive stone walls with watch towers. You can’t get closer to the palace except on the Emperor’s birthday and at New Year. On those days citizens are allowed in. To see this glimpse of the place we walked a long way south along the moat. It was a hot day and there was nowhere to buy a water bottle as we kept walking through a big park. But the scenery was fantastic: the calm water, the old stone walls and the watch towers, the enormous square with pine trees, all this backed by modern Tokyo skyline. We made this fantastic walk together with my husband Clas. It was Saturday and he didn’t work. The rest of the week he did and I kept walking on my own. But I’m used to that and don’t mind exploring cities by myself. So this was our great Saturday walk in old Tokyo, a great walk to take whatever day it is. The second walk starts and ends at Ueno station (Ginza and Hibiya Lines) and you will walk a distance of 4-5 km. 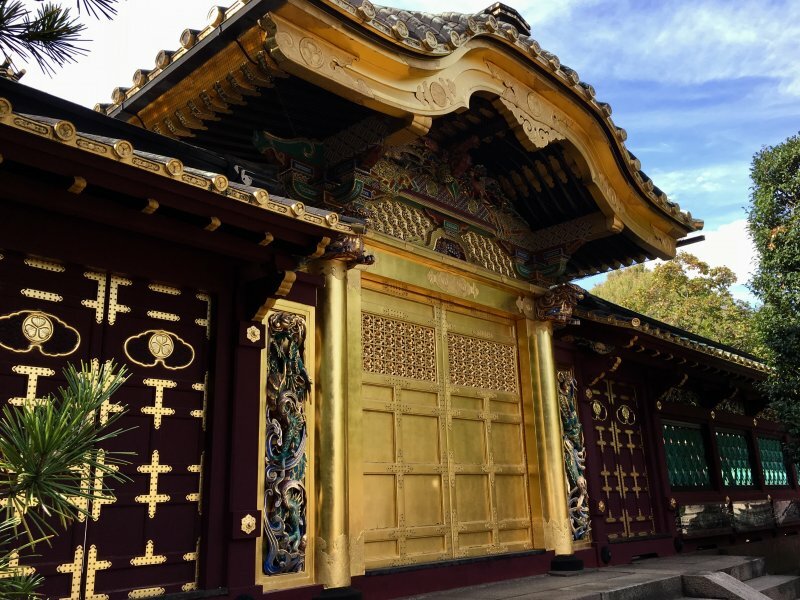 Ueno Park has all the things that are the most loved in Japan: old shrines and temples, a huge lotus pond with cherry tree walkways – and museums that show Japanese history and culture. Ueno Station is one of those huge Tokyo stations. I was wondering were to exit and walked on until I finally came out from the southern gate. So that’s where my walk started and I first saw the south end of Ueno Park. There was Shiobazu Pond after which I walked north and back to the station. The first thing I found was a red temple that has a nice name, Kiyomizu Hall. Today’s first temple was hidden between trees. Kiyomizu Hall looks fresh and painted but it is from 1631. I walked around itl and examined its carvings. I have found the Old Tokyo! I took the stairs down from the temple and there was a pond filled with lotuses. The big plants really grow well. You don’t even see the water. I walked around the pond that is divided by walkways and bridges. There are three different ponds. In autumn there were no lotus flowers left but green lotus leaves look amazing enough. The pond has a small island in the middle, a temple island. The temple is called Benten Hall and looks very different from the one up on the hill. The walkways are lined with cherry trees so this must be a good hanami setting in spring. In these latitudes late March and early April is the cherry blossom party time. But these ladies were having a good time without any cherry blossoms. They were on the way to the temple. Behind the pond are the Ueno Zoological Gardens. It’s the first zoo ever opened in Japan and they have pandas, tigers, lions and other big animals. I skipped the zoo and went up the hill. And what did I find? A fox shrine. This one is entered along a narrow walkway that leads down to the shrine. It is like a tunnel since there is a long row of red shrine gates called torii gates. The meaning with them is to mark the way to a sacred place. This was the first time ever I saw a torii gate so I walked over and over the same route. It was so nice that I couldn’t stop. The shrine has a fox statue in front, an Inari fox. Gojoten Shrine is dedicated to the Shinto god of rice and the fox is his messenger. But what is that bib for? Is it meant to be there? Red poles showing the way to a Shinto shrine. Ueno Park has a thousand cherry trees, around the lotus pond and along the main walkway. The place must look amazing in spring, I’d love to see that! Then I found a little hill with a stupa. A small one with a big statue outside. And the statue has a bib! There had been a lot of walking and I was wondering if there would still be anything more to see. As I walked on towards the National Museum I saw people gathering on the left hand side. And of course there was a shrine. This shrine was shining in gold and had carvings and decoration everywhere. This must be a shrine that has an interesting history. There were no red gates to this shrine. Instead there were long rows of lanterns across the shrine grounds, all made of stone or copper. The ones in the same row were all similar and the whole beauty was backed by a pagoda with five stories. The five-storied pagoda is behind a fence. It is in the zoo so you can look at it but not touch. Pink and purple dahlias and paper umbrellas providing shadow from the strong sun. All in matching colors. And then ugly demons, maybe scaring birds? This is Tokyo National Museum, one of Japan’s main museums. The other Ueno Park museums are the National Science Museum, the National Museum for Western Art, the Tokyo Metropolitan Art Museum and Shitamachi Museum. I took the subway back to the city but if you want you can continue to Nezu. It’s very close to Ueno but as distances are long in Tokyo I made it a separate walk. The third walk to the Old Tokyo is a 5 km loop. My itinerary begins and ends at Nishi-Nippori subway station (Chiyoda Line). Alternatively you can finish either at Nezu station (Chiyoda Line) or at Nippori train station. Coming out from the Nishi-Nippori station tunnel take the small lane on the left. The lane winds uphill and you will enter a quiet residential area dotted with small temples. Temples, shrines and graveyards exist in every corner and between houses. Tokyo has been hit by earthquakes and wars which have destroyed most of the original Tokyo. But Yanaka has had luck with it and survived for centuries. In Yanaka you can still find winding alleys, traditional low-built houses, tiny shops and eateries – and those small shrines and temples that are so typical of Japan. The old Tokyo lives on in Yanaka. Yanaka temple yards are filled with this kind of figures. They look like small Buddhas and someone has dressed them up in red hats and bibs. Now I had to start asking. I had to find out what this is all about. Since the hats and bibs look so funny in my European eyes. But their story is far from funny. The statues are deities for children that died too early and it’s the desperate parents that bring these hats and bibs. They are doing it since the clothes protect the child where he is. Red is the most protecting color and that’s why mostly red color is used. But the hats and bibs have one more meaning. They are there to protect the statues from cold. The Japanese think that both living and non-living things have a soul. Ojizosama statues exist all over Japan but what about Japanese cemeteries? Yanaka has an old and well-known cemetery, a very traditional one. Many famous Japanese people are buried here but even without them the graveyard is worth walking through. It’s a very peaceful and shady place. And Japanese graveyards in general look so different from what we in Europe are used to. Small shops, museums and galleries, coffee shops and simple eateries. That is what Yanaka’s lively main street Yanaka Ginza is made of. I have to say I like this a lot more than the real Ginza in Central Tokyo. I went there but for me the real Ginza is too hectic and too commercial. It’s just like any shopping street in Asia. Yanaka locals are not in a hurry, they just stroll around performing their daily shopping. Where Ginza ends turn south towards Nezu Shrine and try to find Hebimichi Yomise Street. It’s a narrow twisted lane that winds like a snake – as the name says. Hebimichi means snake road. I didn’t get a good photo of Hebimichi but I have some examples of other Yanaka streets. All streets are the same style. Go to Yanaka. It’s an old and original Tokyo suburb. Just like Japan used to be. With some exceptions like modern school statues. Hebimishi snake road leads to Nezu shrine that is hidden in a residential area with has the same name. The shrine is close to Nezu subway station, it’s only a five minute walk. 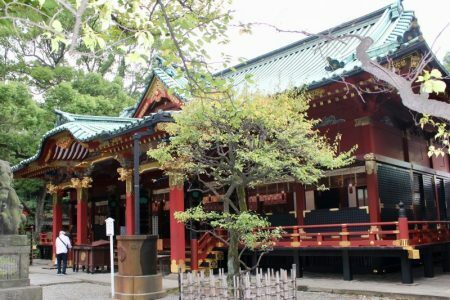 Nezu Shrine is on the list of Important Cultural Properties of Japan. It’s one of Japan’s oldest shrines, almost 2000 years old. In fact there are two shrines, is a small one on the hillside and a main shrine with a big yard lower down. You walk to the hillside shrine through a long tunnel of arches, much longer than the one in Ueno Park. The hillside shrine overlooks a green pond with red fish in the water. The fish has the same color has the torii gate so everything matches in this temple. And in spring when azaleas are in bloom the place all shines in perfect purple. It’s the round bushes that fill the hill slopes. Jomyoin Temple is simple and not worth a walk but there is something else in its grounds. Long rows of small stone statues fill the temple yeard, all of it. The statues are so many that there’s no room for anything else on the yard. They are said to be 84 000 in number. A surprising collection of Ojizosama statues, but why are these ones without bibs and hats? 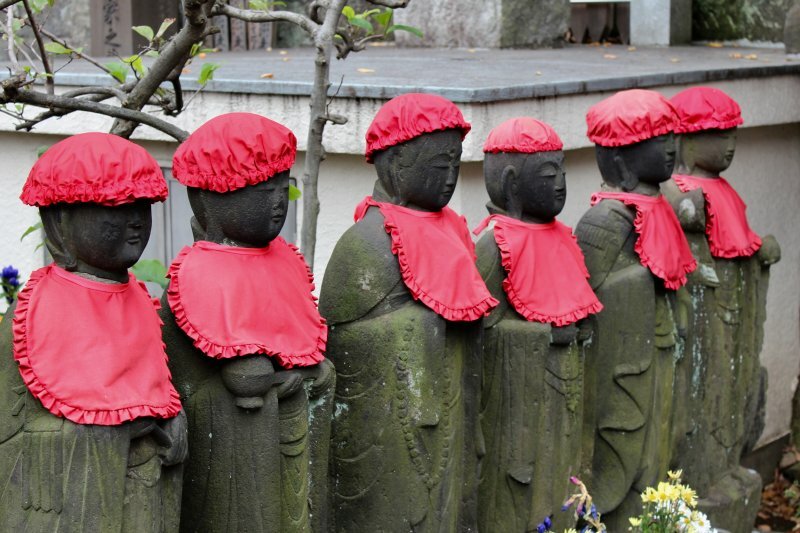 They are different, they represent Jizo, a Buddhist deity and he also protects children. Jomyoin temple yard ends our walk number 3. The last of my walks in Old Tokyo is 2 to 3 km long and the itinerary begins and ends at Asakusa Station. You can reach Asakusa by subway (Asakusa and Ginza Lines), by train or by river ferry. Asakusa is Tokyo’s old downtown. Asakusa main sights are Senso-Ji Temple, one of Tokyo’s top sights and the Tokyo’s historic downtown around it. From Asakusa Station walk north through the city that’s partly old and partly modern. 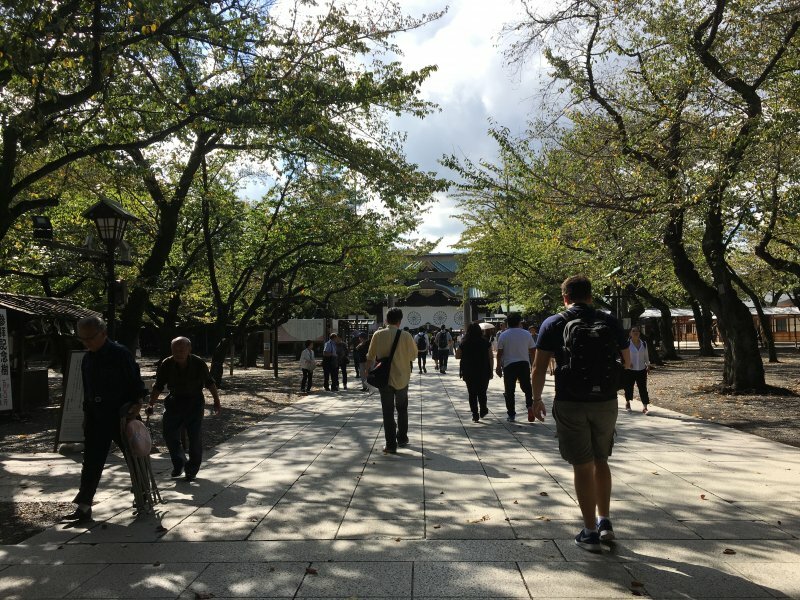 The pedestrian zone begins at Kaminarimon Gate and from here on you will have historic old Tokyo buildings all the way. The gate shows the way to the temple area. Just step in and don’t let this guy and his ugly friend scare you. The two huge statues on both sides of the gate are watching your every step. They are guardians and maybe they look like that just because Kaminarimon means Thunder. It’s a Thunder Gate. Nakamise Shopping Arcade fills the lane from Kaminarimon gate to Senso-Ji Temple. Long rows of small shops sell Japanese kimonos, slippers, combs and all kind of typical handicraft. If you like Japanese articles this is your place to shop. Senso-Ji is Tokyo’s most important temple. The area has a lot of temple buildings in different sizes but they all have a similar style. That makes Senso-Ji temple area a wonderful place for a walk. And locals coming to the temple for their rituals only add to the atmosphere. Though there were not many people around the night I was visiting. It was a rainy evening so most people kept indoors. What I liked most was the main hall. You can see it in these photos from different ankles. And I also liked this five-story pagoda that looks fantastic with its evening splendor. Sensoji Temple has been here since the 7th century but most of it got hit in the war so what you see has been rebuilt afterwards. Right next to the temple area you will find Asakusa old town. Asakusa was built in the Edo time which was in 1600-1800s. At that time Tokyo was called Edo and the whole country was ruled from here. Edo style city quarters grew around Senso-Ji Temple and many of these quarters still remain. Asakusa is full of typical Japanese buildings with thin walls. It’s he kind of buildings you want to see in Japan. 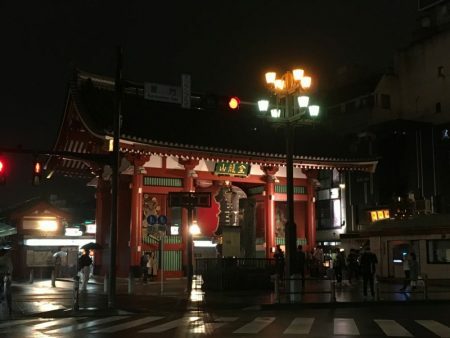 And knowing that Asakusa has long rows of cozy restaurants and small hotels and guest houses to choose from it’s easy to understand that it is a tourist area. Using the subway this is not far away the city. Nothing is far away in Tokyo, the connections are so good. So now we have found the Old Tokyo. In Asakusa – and in Yanaka, Nezu, Ueno, Korakuen and in Tokyo downtown. Old Tokyo exists in many parts of the city, you just have to discover it. Hope my short walks in Old Tokyo gave you an idea what this huge modern city also is like. Old and new exist side by side in Tokyo – like these plastic flowers in the historic streets of Asakusa. But who cares? Tokyo is Tokyo.